Are neonicotionoid pesticides responsible for the demise of bees? 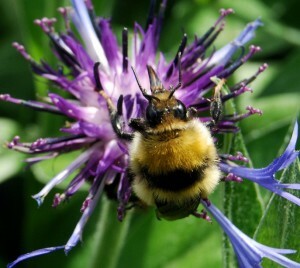 A very good summary of the neonic situation by Dr. Rosemary Mason and Dr. Derek Thomas, “long standing environmentalists” from the U.K.
One of us has just returned from Orkney, where for the first time, we found the rare great yellow bumble bee (Bombus distinguendus), now restricted to Northern Scotland and the offshore islands. She was leisurely foraging on red clover and garden knapweed on a track at the edge of Kirkwall, the biggest town on Mainland. I had been to Orkney some 25 years before to see the hen harriers. They had been studied by Eddie Balfour until his death in 1974 and later described by Donald Watson in ‘The Hen Harrier’, his impressive monograph about this iconic bird published in1977. However, over the last 20 years or so, the massive decline in invertebrates (animals without backbones) is a much more terrifying prospect than loss of a single rare species. Of course, many people don’t care much about invertebrates and would say “so what?” But all higher species (including humans) are completely dependent on them. Birds, amphibians and bats feed on insects, most crops depend on their pollination services and microbes recycle nutrients in soil and aquatic ecosystems. Hop on over to Mark Avery’s blog to read the full article.